During the Irish revolution, a family earns a big inheritance. They start leading a rich life forgetting what the most important values of are. At the end, they discover they will not receive that inheritance; the family is destroyed and penniless. They must sell their home and start living like vagabonds. Sean O'Casey's play was first performed at the Abbey Theatre in Dublin in March 1924. In November the following year, The Irish Players brought Juno and the Paycock to London where it played for over 250 performances. Although O'Casey had deep reservations about allowing his work to be filmed, Ivor Novello and Adrian Brunel persuaded him to visit Elstree Studios where he met with Hitchcock whilst he was filming Champagne. 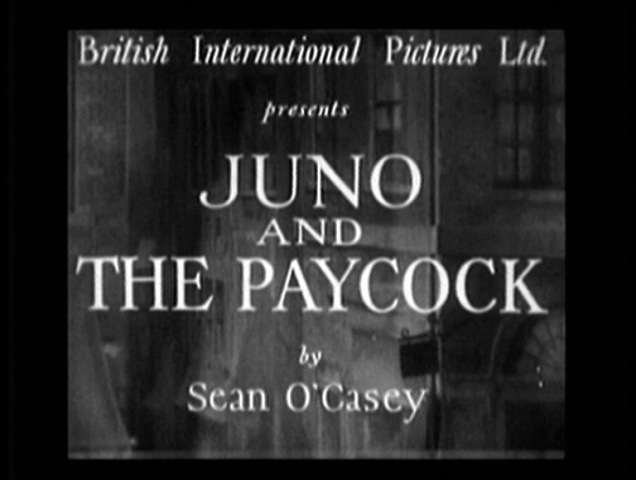 Over the following months, the two met several times and Hitchcock was not only able to secure O'Casey's approval to film Juno but also coaxed the playwright into writing a new scene for the beginning of the film. The screen adaptation, which was relatively faithful to the play, was written by Alma Reville and provided her with her first official script credit on a Hitchcock film. The cast several actors linked to The Irish Players and the original play — Sara Allgood had played Juno in Dublin, her sister Maire O'Neill, Sidney Morgan and Kathleen O'Regan. Filming took place during November and December 1929, predominantly on a single-room set. In Juno and the Paycock we wanted to get over a medley of noises: the machine guns that were firing down the street; the tinny note of a cheap gramophone playing in the room; the chatter of other people in the room; the tread-tread tramp-tramp of a funeral procession going by. The funeral was that of a man whose death John Laurie had encompassed, and the scene was a close-up of him by the fire, and the effect these various blending noises had on him. So we filled the studio with the noises. In one corner was a crowd of people talking in low voices; in another, half a dozen people marking time; in a third, a stagehand was beating a sofa with two canes to make the machine-gun fire. But we couldn't get a record of the tune we needed. So the fourth corner was filled by the property man singing the tune through a megaphone. But that just sounded like a man singing, not like a cheap gramophone. So we clipped a clothes-peg on his nose. And the scene reproduced perfectly. Whilst praising the film as "work of art; well photographed, well acted, and carrying conviction in every word and scene", The Times review noted that Hitchcock had "been so faithful to his text as almost to forget the medium in which he was working". The Manchester Guardian felt that the film wasn't as good as "Blackmail" — "There is a certain lack of imagination in the grouping and the cutting, but there are also moments of beauty ... and there are many interesting uses made of sound." There is little to exploit in this production. Play up the play and the Irish Players who first presented it, laying stress upon the fact that Sara Allgood, the Mrs. Boyle of the original production, appears in the screen version. Center your advertising on the intelligentsia and your Irish clientele. This will appeal to those who like the better things in their movie fare. ↑ The play initially ran at the Royalty Theatre, Soho, from 16/Nov/1925 to 05/Mar/1926, then transferred to the Fortune Theatre in London's West End from 06/Mar/1926 until 07(?)May/1926. ↑ The Manchester Guardian (01/Jan/1930) - An Irish "Talkie"